The people of Veere have been busy celebrating the completion of its six tapestry panels! 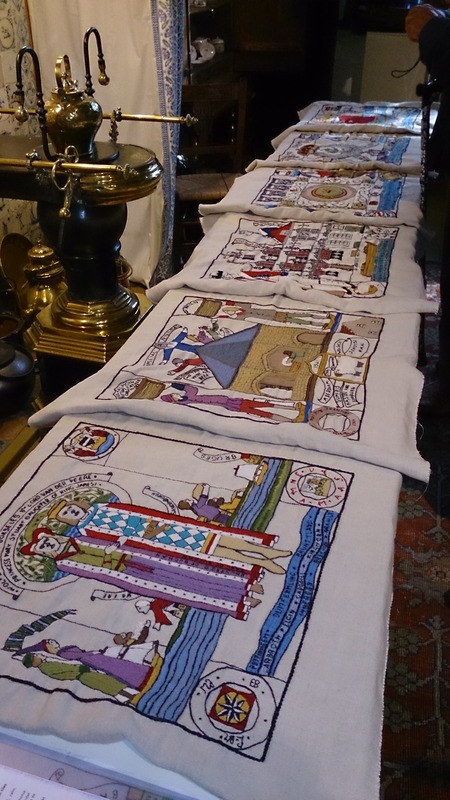 We've been reporting regularly of the brilliant progress the stitchers of Veere have been making, recording the significant historical connections between their community and Scotland. Now they can sit back with pride and say "we've done it! ", but not before sending the panels off with appropriate style! The celebrations were featured a cast of stitchers and local school children, costumed performances and, of course, a piper kilted in the Veere district tartan! The events were overseen by Christina Polderman, secretary of the Veere-Scotland Organisation (http://www.veere-schotland.nl/) along with, appropriately, the Honorary Conservator of Scottish Privileges, Neil Wallace. The mayor, who himself placed the first stitch in the Veere panels, is seen below asking the Honorary Conservator to place the final one. The completed panels were laid for people to view in the Scots Houses Museum, the hub for all Scottish-Veere activity. The beautiful colours and rich stitching made for an impressive display (right). Above you can see a photograph of one of Andrew Crummy's original drawings, provided to the volunteer stitchers as the guide for their work, and seeing it beside the completed panels must have provided a considerable sense of achievement! The completed panels are now en route back to Prestonpans, where they will be photographed, blocked and backed in preparation for display. Their images will then be added to the Veere pages on this website, where you can already read the accompanying notes (here). In the meantime, here's a sneak preview! Of course, Veere isn't the only place in the Netherlands with Scottish connections. Look out for future news from Rotterdam!